The project explores how migration and current immigration policies are impacting their lives, how satisfied they are with local services, the quality of their relationships, and their feelings of identity and belonging in the UK. The project is important because it presents the first analysis since the Brexit Referendum of how current plans for Britain to leave the European Union are impacting on young Eastern Europeansâ&#x20AC;&#x2122; lives. We have gathered the opinions and experiences of over 1,100 young people on a range of issues: their feelings of national and local belonging, their participation in communities, their access to services, their experiences of racism and exclusion, their experiences of education, their relationships, well-being and plans for future now that the UK is planning to leave the EU. These Briefings aim to inform a wide range of audiences on the experiences of young Eastern Europeans living in contemporary Britain. The Briefings should also help local authorities and other organisations develop policies and improve services for young people, taking into account their needs and experiences. Here to Stay? 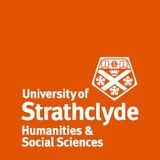 is a research project which explores the lives of young people who arrived in the UK as migrant children from Eastern Europe (EE). It focuses on young people (aged 12-18) who migrated after EU enlargement in 2004 and have lived in the UK for at least 3 years. Box 1. Profile of survey respondents •	The survey took place between October 2016 and April 2017. In total, 1120 young people completed the survey, with 807 full completions. •	Overall, the survey attracted mainly young people aged 16-18 (68%), while 32% of respondents were aged 1215. There were more female respondents (60%) than male (38%). The vast majority of respondents identified as White (97%). The majority said they were Christian (59%), while over a third (37%) identified as nonreligious/atheist. •	Over half of the respondents were Polish born (56%), followed by Romanian (10%) and Lithuanian (9%) nationals. The other 25% of our respondents were originally born in other EU and non-EU countries to Eastern European parents. •	Most respondents lived in England (71%) and some in Scotland (19%), while 10% did not give their location. •	Over a third said they had lived in the UK for 10 or more years. •	Sample criteria: Please note that this was a convenience sample, recruited through schools, youth clubs and social media. Our data is not generalisable to the whole population. The data could not be weighted due to the absence of existing reliable data on young EU nationals in the UK. Our survey found that many young people who moved to Britain from EE countries during childhood developed a feeling of national belonging to the UK that may be disrupted by Brexit.Young people are unsure whether they will be able to continue living in Britain and over 80% did not feel hopeful about Britain’s decision to leave the EU. Young people who said that their school was supportive of EE-born young people were more likely to feel a sense of belonging to the UK. We also found that those who said that their school was supportive were more likely to want to be living in the UK in 2020. Overall, a stronger feeling of belonging to the UK was associated with young people having higher levels of satisfaction with their lives in the UK. When asked about a sense of belonging to their local neighbourhood, 43% said that they ‘always’ or ‘mostly’ feel that they belonged in the neighbourhood where they lived. At the same time, 27% said that they ‘sometimes feel like they belong and sometimes feel that they don’t belong’, while 22% said that they did not have a sense of belonging to their neighbourhood. This suggests that developing a sense of local belonging has been challenging for some of the young people, perhaps more so than developing a feeling of national belonging to Britain. However, some of the young people commented that they had experienced increased racism in their neighbourhoods since the Brexit Referendum and this had changed the way they felt about their neighbourhood. Eastern European young people who experience racism are less likely to feel a sense of belonging to Britain and their neighbourhoods The majority of young people who participated in our survey said they had experienced racism and xenophobia because of their nationality, accent, colour of their skin or appearance (78%). Almost 1 in 5 (19%) said that they experience racism ‘very often’ or ‘often’. Since the EU Referendum, 49% said that they had seen more racism, 24% said they had seen about the same amount of racism, 5% had seen less racism and 23% could not say or have seen less. Young people who had experienced racism and xenophobia were less likely to feel a sense of belonging to the UK. Similarly, young people who had experienced racism were less likely to feel a sense of belonging to their neighbourhood. For some young people, this is because racist incidents have occurred in their schools and the neighbourhoods in which they live. Young people also commented that the result of the Brexit Referendum had altered their feelings about their neighbourhoods because of hostility towards immigrants being expressed openly by people they knew. feel a strong sense of belonging to online networks Our survey shows that online social networks are an important part of young Eastern Europeans’ everyday lives in Britain. Out of 827 respondents, 43% said that they spent three hours or more each day using online social networks, 22% said they spent up to three hours, 21% said up to two hours, 10% said 30 minutes to an hour, 4% said less than 30 minutes. The most popular social networks were Facebook (72%), Messenger (67%), Instagram (61%) and SnapChat (60%). When we asked young people how strongly they felt they belonged to their online social networks, 23% said that they felt that they belonged to them ‘very much’ or ‘quite a bit’ (34%), while 20% said they feel they belonged to online sites ‘sometimes’. Only 1 in 5 young people said they did not feel they belonged to online networks. Despite a strong sense of belonging to online groups, young people expressed the strongest feelings of belonging to their families (63% felt very much part of their family) and their offline friends (47% felt very much part of their friendship group). •	Young people born in Eastern Europe often feel a strong sense of belonging to the UK. This sense of national belonging appears to become stronger the longer young people have lived in the UK. However, many young people feel that their sense of belonging to Britain, and their future life plans, are more uncertain because of Brexit. •	Young Eastern Europeans are developing feelings of national belonging to the UK at the same time as having a strong sense of European identity. However, their feelings of local and national belonging have been impacted by Brexit and many have experienced increased levels of racism and xenophobia in their neighbourhoods. •	If a young person feels that their school is supportive of Eastern European pupils, they are more likely to feel a sense of belonging to the UK and also feel that they have a higher likelihood of still living in the UK in 2020. •	Young Eastern Europeans who experience racism and xenophobia are less likely to feel a strong sense of belonging to Britain and their local neighbourhood. Experiencing racism also lowers young people’s feelings of satisfaction with their life in the UK. •	Many young Eastern Europeans spend a lot of time on online social networks, which can be important sites of belonging, in addition to their families and friendship groups. Based on the survey findings, we are making the following recommendations to local authorities and organisations working with young people originally from Eastern Europe. We hope these recommendations will ensure that young people can benefit from services and policies which support them throughout the Brexit transition. •	Young Eastern Europeans are actively considering their future life plans because of the social, economic and legal uncertainties associated with Brexit. We believe they should be fully involved in any consultations at local, regional and national level, to ensure their experiences and needs shape policy and practice. •	Organisations working with Eastern European nationals should ensure that young people and their families can access up-to-date information on decisions made in relation to the post-Brexit situation and their status. Currently, young people are unsure of their rights and where to find information. •	All agencies who work with young people need to be aware of the increased levels of racism that many young Eastern Europeans are facing in their neighbourhoods and schools, and work together to combat the negative impacts of racism on young people’s feelings of national and local belonging. •	Organisations working with Eastern European young people should consider providing young people and their families with emotional support during the Brexit transition. Young people will need support in making decisions about their future, which may include out-migration. •	Fostering supportive school environments is very important for Eastern European young people’s feelings of national and local belonging, and their overall wellbeing. Schools need to ensure that staff recognise the multiple uncertainties young people and their families are facing due to Brexit, and put measures in place to support them in their decisionmaking over their futures. •	Many young Eastern Europeans spend a lot of time using online social networks. Organisations and services should consider providing information and support relating to Brexit to young people through online social networks. Briefing No. 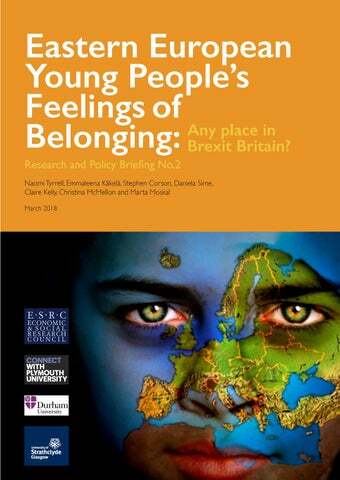 2: Eastern European Young People’s Feelings of Belonging: Any Place in Brexit Britain?